#IamFCPS is a critical friend to our public schools in Fairfax County. We work to engage community leadership in creating fiscally sustainable public schools so that children can receive the teachers, class sizes, and quality programming they need to be successful in life. #IamFCPS is a grassroots campaign led by parent volunteers, without major funding. In 2015, #IamFCPS was formed in response to 10 years of FCPS not receiving full funding of the Superintendent’s requested budget from the County Board of Supervisors. We worked into 2016 to help parents, educators, and community members advocate for our schools. No more cuts. Fully fund the budget. Our work is credited in part to achieving more funding for FCPS in 2016. However, this year’s and future years’ school budgets are still at risk of not being adequately funded for our children. Is a public informant, keeping a critical eye on our schools and public budgeting process. #IamFCPS seeks collaborative leadership to solve the FCPS funding problem. This means the county and state working together. The process must welcome families working with policymakers at all levels to reinvest in our schools. An immense amount of work remains to ensure that our schools receive the budget they need every year. And we need everyone’s help! 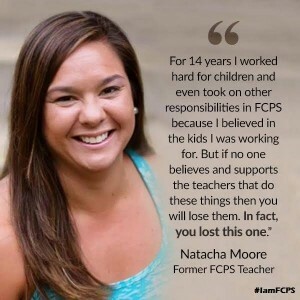 You are part of #IamFCPS, too.